Apparently, mutual suspicion and misperception exist between the leadership in Phnom Penh and Washington. Most top leaders of Cambodia, including Prime Minister Hun Sen, joined the underground communist movement against the U.S.-supported Khmer Republic. Therefore, so-called “anti-American imperialism” is their political background. Hun Sen’s regime was isolated and embargoed by the West from 1979-1991. In addition, Cambodia’s historical memories of its colonial past and foreign powers’ intervention during the Cold War might have left Cambodian leaders very respectful of their country’s sovereignty. In their worldview, therefore, the U.S. is a bullying superpower that is willing to interfere in the domestic affairs of small states. Meanwhile, in the eyes of the political elite in Washington, Hun Sen’s government is, in the words of Republican lawmaker Steve Chabot during a Congressional hearing in July 2013, leading an “authoritarian, corrupt political system.” Such a perception exists within White House’s foreign policy establishment, which explains why invitations for an official visit to the U.S. have never been extended to Prime Minister Hun Sen or even to Foreign Minister Hor Namhong. It is worth noticing that Hor Namhong’s visit to Washington in June 2012 was a working visit, not an official one, while Cambodia assumed the ASEAN chairmanship. Second, the two countries disagree on Cambodia’s debt of approximately $450 million, owed by the Lon Lon government in the early 1970s. Calling it “dirty debt” for fueling the country’s civil conflicts, Phnom Penh has sought debt cancellation and foreign aid. While expressing a willingness to reschedule loan payments, U.S. officials have demanded that the Cambodian government first sign a bilateral debt agreement, acknowledging its obligation, and begin making payments before negotiations on the terms of its debt begin. In the eyes of officials in Phnom Penh, the debt has been a political tool that Washington keeps playing up to pressure the Cambodian government to support its regional agenda. The Obama Administration has been constrained by American bureaucratic politics in dealing with Cambodia, presenting it with a conundrum: how can we promote human rights and our strategic interests? For example, in the wake of Obama’s visit to Cambodia in November 2012, a dozen U.S. lawmakers sent a toughly worded letter to call on the U.S. president to publicly address human rights issues in his meeting with Prime Minister Hun Sen. Some human rights groups even urged the president not to meet with Prime Minister Hun Sen. In the end, President Obama only briefly met with Prime Minister Hun Sen. While U.S. officials called the meeting “usual protocol for a U.S. President on the sidelines of an EAS summit,” Obama reportedly focused on human rights issues, urging the Cambodian leader to release political prisoners and allow opposition parties greater freedom. Obviously, those statements reflect complicated political trends in the U.S., where interest groups, including think tanks and human rights activists, are quite influential. Moreover, the Cambodian Americans who are generally critics of Hun Sen’s government are a strong political force that American politicians cannot ignore, particularly in states with large number of Cambodian-Americans. Based on the 2013 U.S. census, there are around 320,000 people of Cambodian descent living in the U.S., primary concentrated in the states of California, Massachusetts and Washington. 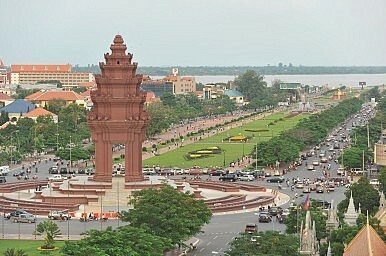 China: Best Strategic Option for Cambodia? The Obama Administration’s engagement with Cambodia has taken place amid rapidly increasing Chinese influence in the country. As of 2014, China has become Cambodia’s largest foreign investor and economic benefactor, with cumulative commercial investments reportedly worth $10 billion and development assistance totaling over $3 billion. In recent years, Beijing has also provided military assistance and equipment, including trucks, helicopters, and aircraft to the Cambodian armed forces. It has furthermore built military training and medical facilities, and donated uniforms. In May 2014, China announced that it would provide over 400 training scholarships for Cambodian military officers. Strategically, given the history of animosity in the region and recent border disputes Cambodia has endured with its neighbors—with Thailand in 2008-2011 and ongoing tension with Vietnam—Phnom Penh might opt for alignment, rather than alliance, with China. Cambodian leaders might buy into the old saying that “a nearby friemd is more reliable than a friend from afar.” Noticeably, while Phnom Penh was hosting the Cambodia-Vietnam Joint Border Commission Meeting in July 2015, Cambodian Defense Minister Tea Banh visited Beijing. During a meeting with Tea Banh, Vice Chairman of the Central Military Commission Xu Qiliang said China and Cambodia offered firmly mutual support on issues of sovereignty, security, and development. Obviously, between the U.S. and China, Cambodia’s choice is China. China seems to be seen as a trustful friend that Cambodia can rely upon to ensure its sovereignty, territorial integrity, and protect its pursuit of prosperity. The author is a PhD student in International Political and Strategic Studies at the Australian National University. He is also a senior research fellow at the Cambodian Institute for Strategic Studies (CISS) and senior lecturer at the Department of International Studies (DIS), Royal University of Phnom Penh.